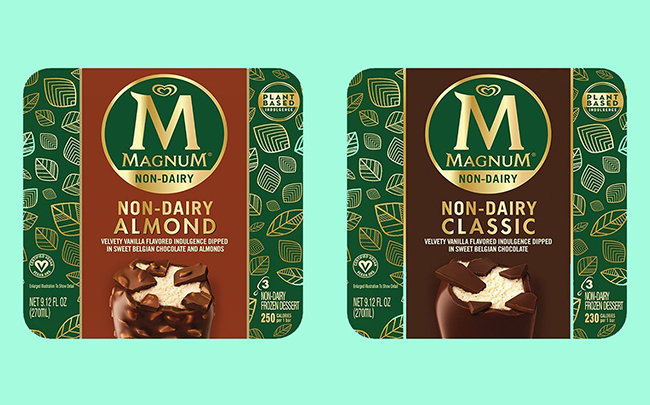 Magnum’s dairy-free, vegan ice creams are now available to purchase in the USA! Magnum first announced the launch of a vegan version of its popular frozen treat into the European market in 2018, and now they’re making their way across the pond to the US in time for summer. Vegan Magnum’s are available in two delicious flavours – Magnum Vegan Classic and Magnum Vegan Almond. The dairy-free ice-creams feature vanilla-flavoured pea protein-based ice-cream coated in 70% vegan Belgian chocolate, which is sourced from sustainably-grown Rainforest Alliance cocoa beans. Leslie Miller, marketing director of ice cream at Unilever, said: “This week we’re thrilled to bring our next-level chocolate to the vegan and dairy-free market. Recent years have seen thousands of innovative new vegan products appearing on supermarket shelves, and one category that has gone from strength to strength is vegan ice-cream. Large companies such as Ben & Jerry’s, Cornetto and Häagen-Dazs who typically make dairy ice-cream have managed to grab a scoop of the action with the release of dairy-free ranges of ice-cream. Magnum Non-Dairy bars are now available nationwide from major retailers in the US, with an RRP of $4.99-5.49.